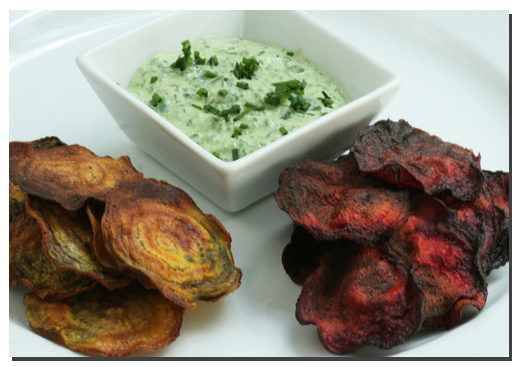 Here is a great dish to use for the Beet Tops. You can use most of the tops from one bunch of beets for this dish. I prefer the taste of the tops from the yellow beets. 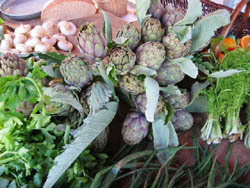 Take the stems off the leaves and blanch the leaves in salted water. Refresh and squeeze out all the water. 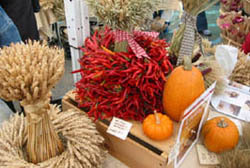 Use a paper towel to dry the leaves into a ball which can be refrigerated till later. When ready to use dice the leaves with 1/2 -1 garlic clove, 1/2 tsp dijon mustard and 1/2 teaspoon ground cumin seeds. Add 1 cup of greek style yogurt and mix well. Blend use a food processor or hand blender until the desired consistency is achieved. If the mixture is too thick add more yogurt to your tasting. Season with salt and pepper and 1/2 juice of a lemon. Depending on your taste you might want to increase the amounts of cumin and garlic. Slice thinly the beets using a mandoline. Set the oven to 350F. In a bowl coat with olive oil and salt. Lay the beet slices (single layer) on parchment paper and roast on one side till crisp. Turn the beet slices over and finish until the desired effect is achieved. See below for alternative cooking times. Depending upon the time you have and the desired cooking styles these beets can be cooked quickly at high temperatures (350-400F) for a crispy quick effect. You must however watch that the slices don't burn. 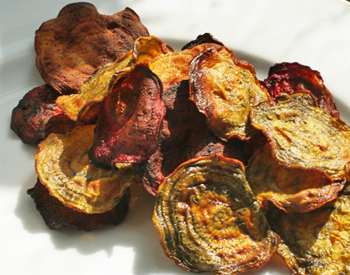 Cooking at low temperatures, e.g., at 225F for an hour or more also results in a crispy beet chip.